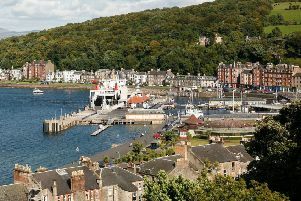 Caledonian MacBrayne is to add a ‘yellow alert’ to its system of warning customers about disruption to its services. The new status, which will apply from Monday, April 11, will be used to tell customers to remain aware and check for updates to their service before travelling, as there is a possibility of disruption. It follows feedback from customers that the ‘amber alert’ status was causing confusion over when there was a possibility of disruption and when services were actually disrupted. From April 11, amber alerts will be used to inform customers that one or more sailings are disrupted - including significant delays, cancelled sailings, suspended sailings, diverted sailings or vessels turned back unable to berth. The red alert status will continue to be used to indicate when all sailings on a route are cancelled for the remainder of the day. Drew Collier, director of operations with CalMac Ferries Ltd, said: “We asked the public what we could do to make their journey easier in the face of weather disruption, and the overwhelming response was that they wanted more information. “Feedback told us that the existing amber alert covered too broad a range of situations and caused confusion. This new yellow alert now separates out potential disruption from actual disruption on a route. “We are committed to improving the services we offer, and listening and responding to our customers needs plays a big part in this. “This change comes on the back of the introduction of a dedicated Twitter service updates account which, since it started, has sent out 36,000 tweets helping our customers keep up to date with timetable changes. The new alert system will also apply to Argyll Ferries’ service from Gourock to Dunoon.